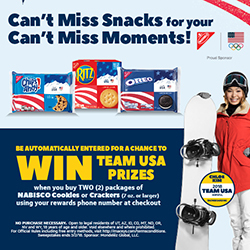 Win Team USA Prizes with Nabisco! The team that snacks together wins together! Enjoy watching all the can’t miss moments during the Olympics with Nabisco cookies and crackers. Enter to win Team USA prizes when you purchase TWO packages of Nabisco cookies and crackers (7 oz. or larger) with your rewards accounts. Earn entries February 5th through March 2nd. Winners will be selected and notified by March 9, 2018. Click here for full terms and no purchase necessary entry. From now-July 4, 2017, buy any TWO (2) packages of Nabisco Cookies and Crackers (7 oz. or larger) using your rewards phone number at checkout and be automatically entered for a chance to win tickets to see Lady Antebellum on August 30, 2017 in Salt Lake City, Utah! These tickets not only include the concert but also a meet and greet with Lady Antebellum! Be sure to pick up lots of Nabisco items and remember to give the cashier your phone number at checkout so you won’t miss out on this amazing opportunity! Click here for the no purchase necessary and terms and conditions.